Often counted among the best boarding schools in the city, SelaQui International School is a coeducational, residential school, and is located at the village of SelaQui in the Dehradun district of Uttarakhand. It is about 20 km from Dehradun on national highway 72 connecting Dehradun with Paonta Sahib and Chandigarh. The school is affiliated to Central Board of Secondary Education (CBSE) and is open to boys and girls from class V onwards irrespective of religion, caste and ethnicity. It also boasts of a healthy international student’s community. The school is located within a 52 acres campus with a natural spring running through it providing an ideal setting for education in a country setting. 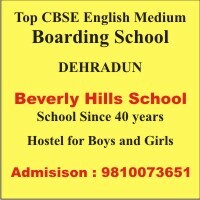 Founded in October, 2000, the school is one of the best boarding schools in Dehradun, India and is managed by Gurukul Trust, a non-profit charitable organization based in Delhi. It owes its vision to Mr. Om Pathak, an ex-Indian Administrative Service officer and a leading educationist of the country. SelaQui International School believes in nurturing every child and views excellence, versatility and leadership as its core values. The Arjuna (sports) programmes at SelaQui are unique to boarding schools in India.